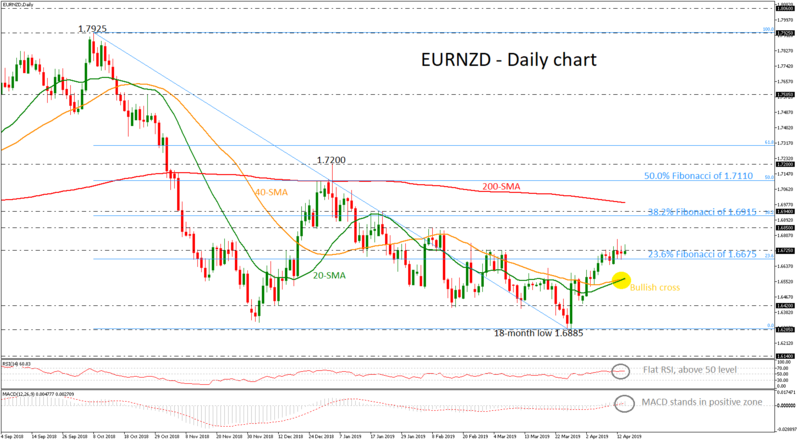 EURNZD has found strong resistance level around the 1.6725 barrier, as it failed several times in the past days to have a daily close above it. The 20- and 40-simple moving averages (SMAs) recorded a bullish crossover in the daily timeframe, increasing possibilities for more upside pressure. The technical indicators though, are flattening in the positive area, confirming the past two neutral days. In case the pair maintains its short-term direction to the upside after the bounce off the 18-month bottom of 1.6885, the bulls will probably challenge the previous top at 1.6850. A break higher could last until the 38.2% Fibonacci retracement level of the downleg from 1.7925 to 1.6880 of 1.6915. On the flipside, declines may drive the price towards the 20- and 40-SMAs near 1.6565 before the 1.6420 support comes into view. Beneath the latter, the 18-month low of 1.6885 which rejected the market’s bearish action recently could be another level in focus. Overall, in the short-term, if the price surpasses 1.6725 and has a daily close above this level, it could open the door for more bullish orders until the next resistance.